No Scottish daily newspaper (either home-grown or tartanised UK national) has backed a yes vote in today's independence referendum for the country. 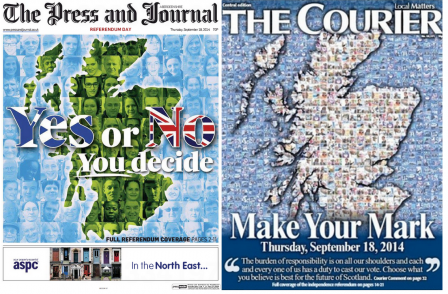 Most of the UK national newspapers back a 'no' vote while most Scottish dailies have stayed neutral saying it is up the readers to follow their own consciences. The Scottish Sun is the best selling newspaper in Scotland and its owner had hinted at support for independence on Twitter. But today's English edition carried the front page "BETTER TOGETHER," on a story suggested Prince Harry may be reuniting with Cressida Bonas. The paper's editorial, in the middle of a three-page referendum special, said "we hope" Scots vote no. The Scottish edition of the paper marked the referendum day with a blank page, saying: "Yes or no. Today Scotland starts with a blank page". Its editorial said it had "faith" in its readers to make the right choice. The Scottish Sun will still be here doing what it always does – looking after the interests of our readers and promoting our principles. "But what we cannot do is tell you how we think you should vote. "This is not a Scottish election or a general election where we can change things every four or five years. "A decision so big that each individual has to weigh up the consequences and make up their own mind. "We believe in the people of Scotland to make the right decision. "Whichever way you choose, The Scottish Sun will continue to fight for you and our Scottish principles." The Herald in Scotland, which has previously said it backs "staying within UK, but only if there's a more far-reaching further devolution", has a front page featuring the headline: "Scotland's day of reckoning". An advert at the bottom of the page for executive real estate says: "NO hassle when you purchase a new property with the 10 year NHBC guarantee". It does not express a firm opinion either way in its coverage today. The Scotsman has already backed the No campaign with a 2,000-word editorial. And the Daily Record has not given a decision either way. The Daily Mirror's front page today says: "Don't leave us this way: A simple message to Scotland: Don't let the sun set on our 307 years together. Vote No today & keep Britain truly GREAT". The Guardian also underlined its view that Scotland should not vote for independence, saying “if this newspaper had a vote, we would vote no”. The Independent, in its editorial, agreed that “our country is not just better together, but in every sense bigger too”. “[T]ogether we have been stronger, more prosperous and more secure; apart we would both be diminished. More than that, we would sever the ties that bind us,” said today’s Daily Telegraph editorial. The Financial Times has already given its backing to the No vote.